Here’s an example of the quality of the premium exterior products that are being installed at Travino Gardens. James Hardie siding with ColorPlus Technology is a superior siding that will require less maintenance and lower costs for homeowners for years to come. ColorPlus is a durable, low-maintenance finish that lasts longer, has 30 % better fade resistance and adheres up to 400% better than any other paint available. And that’s just the outside of the building! Inside Travino Gardens the insulation and drywall installations have begun! This includes installation of Travino’s award-winning soundproofing system that has been tested to perform better than concrete construction. Homeowners at Travino enjoy superior soundproofing that includes significant reduction of vibrations and sounds between homes. 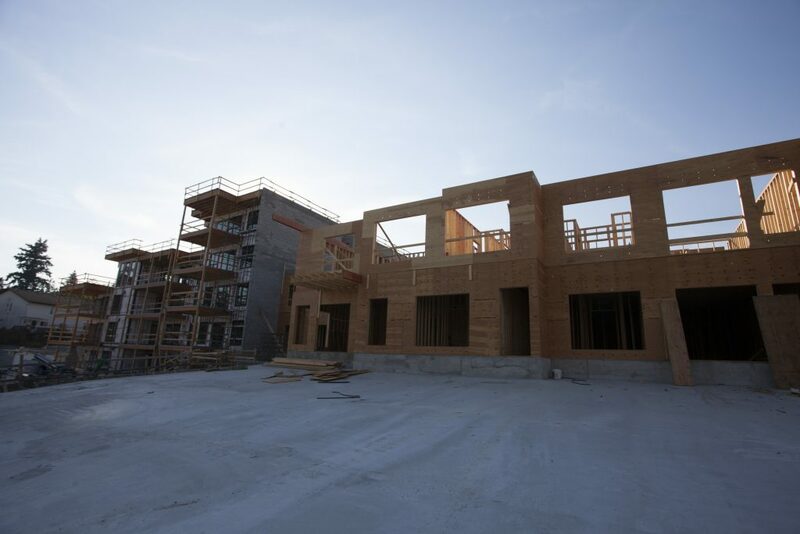 Onto the second half of the Travino Gardens building, framing is on the third floor and we’ll have more to show you soon! Stay tuned for more details. Still thinking about a home at Travino? There are some spectacular homes still available at Travino Gardens, the final phase of this beautiful community. They include a jaw-dropping sixth-floor penthouse, several of our ‘top floor living’ homes with southern exposure and oversized outdoor spaces as well as a handful of garden homes with walkout patios. Get in touch with our sales team today to learn more!